Some days, it feels like spring, but clearly---winter is still here. Inevitably and mercifully, spring is coming. So why not enjoy the last few weeks of winter 2009? Steamy, nourishing coffee drinks are one of the best ways to stay alert, happy, and warm inside….and new coffee options are always appreciated! Enter Kopi Bali coffee. Indonesian Coffee is famous worldwide for its depth, its flavor and its smooth taste. 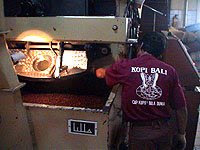 Kopi Bali, which is nicknamed “the legend” based on its longstanding reputation since 1935 as a reliably delicious coffee, has finally made its coffee available on the Web at kopibali.com. Seeing photos of coffee beans being cultivated is humbling. 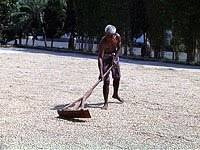 The single man standing in a field of beans gently raking the drying beans seems almost yogic in his focus. The roasting machinery is nuanced and sophisticated specifically because it captures ancient methods and distills them into a reproducible, mechanized art. All of these images come to us from Bali. All told, images of Bali coalesce in the mind’s eye like one beautiful dreamscape. Bali is a place where coffee is available all day long, and many sweet dreams can be nourished. The InfiniteWishes Bali Retreat, scheduled for June 2009 will feature workshops and spa treatments, and offer participants a chance to nurture dreams and bring power to personal goals. Mornings will start with Indonesian coffee----fresh and fragrant. Coffee not only supports and bolsters pragmatic activity, but also stimulates our ability to dream, to envision the life we want, and to work together to achieve specific goals. For more information, contact Deb@MyInfiniteWishes.com. Here’s to drinking coffee in Bali….and everywhere else! When I think about how Joseph Lunetta died on Monday, January 26th, the fact that he was struck by a van is front and center , as is the fact that he was on his way home to meet his friends. I am struck by the idea that given what we have learned about Mr. Lunetta from the Montclair Times, his thoughts were probably focused on the beauty of the morning. When Mr. Lunetta's untimely death was reported in the Thursday hard-copy edition of the Montclair Times, snippets of his poetry revealed more. It turns out that he wrote poetry---like so many others in Montclair, he loved the power of language. Based on snippets alone, we learned that he liked seeing “falling snow” and enjoyed “quiet mornings”. We also learned that he liked coffee very much---and that he liked sharing coffee with his friends. In fact, the thing that sticks with me is that Mr. Lunetta died carrying a tray of coffee. Adam Anik's front page photograph captures the quiet pathos of how that gesture of goodwill was perverted when he was hit by that van. So many cups of coffee lying on the ground, for hours and hours, symbols of an ongoing investigation. 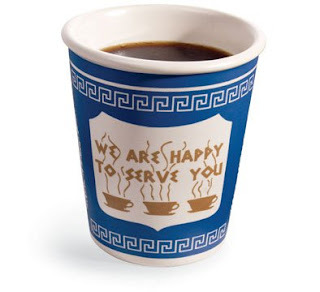 Now it is left to us to wonder how Mr. Lunetta liked his coffee. How much coffee he drank each day. Whether he needed coffee in order to write. By focusing on his life, his penchant for quiet mornings, snowy days, and drinking coffee with friends, we can envision Mr. Lunetta---and quietly mourn him and wish him the best.